While holiday and tiki drinks are not two words generally associated. 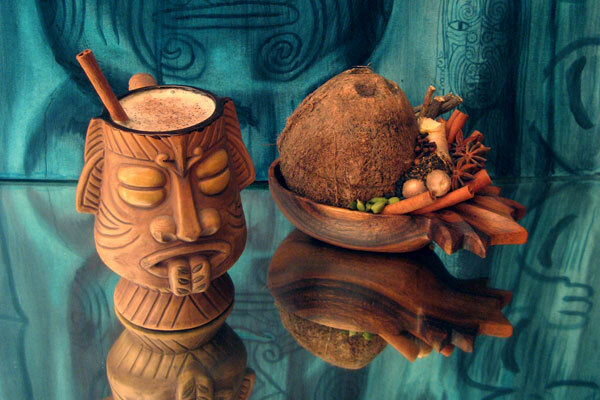 Learn how Jeff “Beachbum” Berry, a self-proclaimed tiki expert, infuses a wintry cocktail with the tropics in this hot drink called a Whitecap. Discover other holiday cocktails in our collection of original recipes from the top bartenders across the nation. Place Lopez, rums, and cloves in a pre-heated specialty mug. Bring milk to a boil, then pour into mug and stir. Top with a pinch of ground cinnamon. Cocktail Blogger Jeff "Beachbum" Berry recommends Lopez coconut cream and, for an amber 151-proof rum, Cruzan or Bacardi.